In an earlier BLOG we discussed “Lowering the Cost of Ownership (COO) of Spin Process Tools.” we did not discuss the fact that the customer does have an option to purchase a used, “used and refurbished” or “as is” version of a tool built at some point in the past as another means of lowering cost. Very short warranty. Used or legacy equipment typically has a 30 to 90 day warranty, whereas today’s new equipment will often have a two-year warranty on components and one year on labor. Availability of spares. Used equipment, some of which was built up to 30 years ago, is becoming more and more difficult to support as the electronic control means are often no longer in production. While this issue is mitigated when new controls are implemented on old platforms, however this adds to the overall cost. Foot print issues. Equipment made before the advent of process stacking, typically done on the thermal modules, occupies more than twice the space as modern tools with Stacking. Used equipment that has stacking capability is often more expensive than new tools with stacking. Installation Costs. Frequently it can cost as much to install a used tool as it cost to buy it. That is not the case with new equipment, where installation costs and facility costs are low. Process support. New tools come with factory process support not typically available in used tools. Software support. New tools can be “tweaked” to meet specific customer requirements, whereas used tools typically are not available with ANY software support or modification. Capability to meet new process requirements that did not exist at the time of the design and manufacture of the used tool. 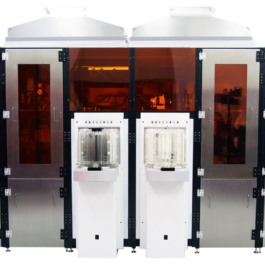 Such factors as multiple movable dispenses, high reliability robots, hot plates designed to handle thicker photoresist films typically used in special purpose photolithography. A great deal of the used “track” equipment was built before the advent of Semi Safety Standards and is difficult, if not impossible, to render safe. The photoresist process equipment available today is low in cost and high in functionality and reliability. It can be tailored to the specific needs of the very specific customer who buys new and not used.